Before I visited Ann Arbor for my #MittenTrip this weekend, my impressions of the city consisted of college weekends with friends who were attending the University of Michigan. We always had a great time, and the Big House is probably my favorite place to watch a football game, but I never considered that there was more to AA. I was instantly overwhelmed with recommendations from friends and locals when I started talking about my #MittenTrip! AA boasts an artsy, food-loving downtown with good nightlife and fun shopping. 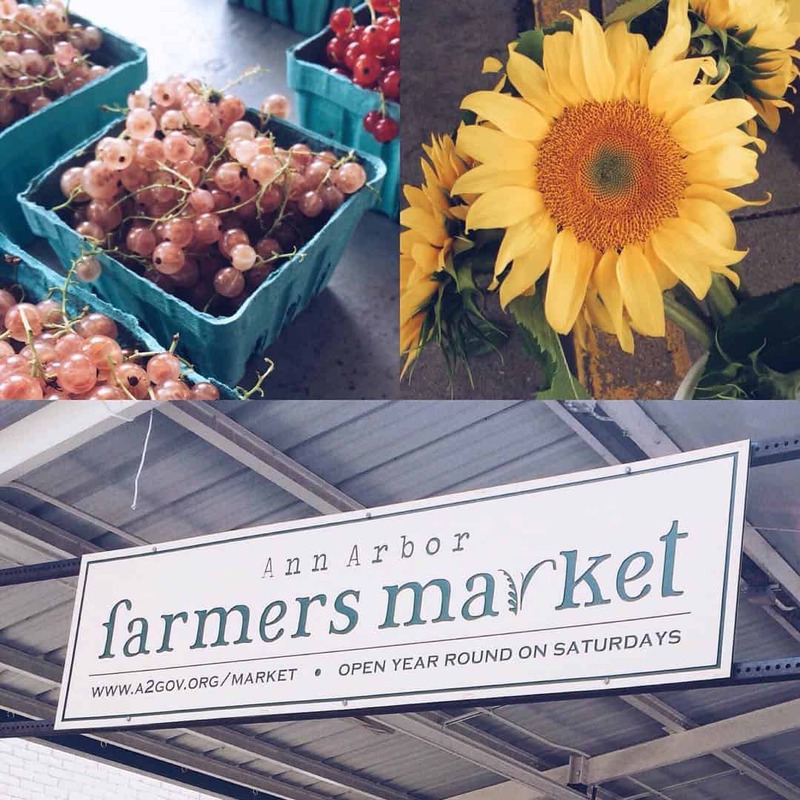 It was a wonderful weekend (that surprised me a bit) and I hope my #MittenTrip guide helps plan your next trip to Ann Arbor. I happened to sneak out of work a little early on Friday, so I left Grand Rapids around 4, desperate to beat rush hour – it kind of worked. When I arrived in Ann Arbor at 6:30 PM, my first stop was to check in at the Hilton Garden Inn; it was so clean and friendly! It’s about a ten-minute drive to downtown so this would be a perfect stay if you have things to see outside of downtown as well. By virtue of a beautiful accident, our weekend stay happened to coincide with the 56th Annual Ann Arbor Art Fair. The Hilton Garden was walking distance from a convenient art shuttle pick up so we were able to hop on the shuttle for Main Street for a mere $1.50 each. As a woman familiar with ArtPrize, I was delighted to see the hustle and bustle of families enjoying the sidewalk patios, wandering through the tents, and using the public transportation. Many guests held their purchases, but no one walked faster than leisure called for. Ann Arbor Farmers’ Market. Photos by Lyndsay Israel. 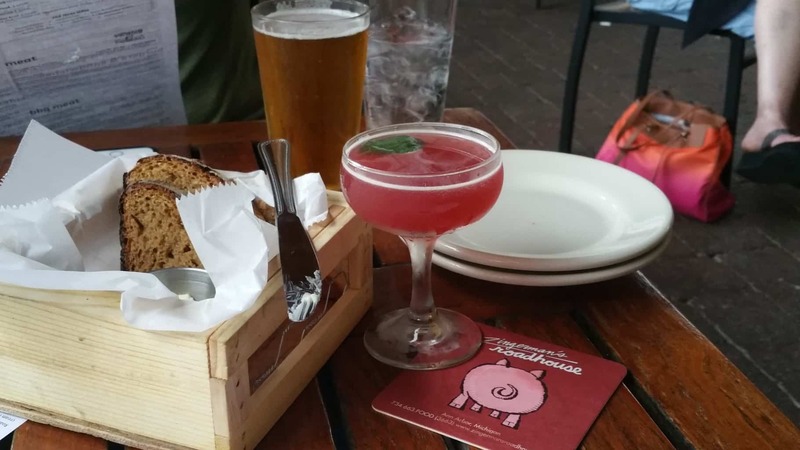 After a bit of browsing the fair, we headed to Jolly Pumpkin’s rooftop patio to enjoy a late dinner. We only waited long enough for an appetizer and drinks (Farmer’s Frittas and a Diabolical IPA from North Peak) before we were sat on the patio, where we switched to cocktails (Dark and Stormy) and shared an entrée (fried chicken and orzo mac and cheese). Between that and the high humidity, we could have sat in those seats all night…but Ann Arbor was calling our names so we continued on. After dinner, it was on to Bill’s Beer Garden, an awesome mingling space for twenty and thirty-somethings with a great line up of Michigan draft beers. We sat until they closed at 11 and then headed right across the street to the Beer Grotto, a taproom recommended by craft beer enthusiasts. The atmosphere in the Grotto was very laid back and we were encouraged to taste before we made any hasty decisions on pints. It was then time to Uber back to the hotel because we had lots on the “to-do list” for Saturday! We tried not to sleep in, but sometimes it’s a fruitless effort. Even with the extra sleep, though, our early start wasn’t off by too much. Breakfast at the hotel was wonderful (build your own omelets, yum!) and we were headed to the Ann Arbor Farmer’s Market by 9:30 AM. Before we left the hotel, we took a minute to decide on lunch at Zingerman’s Deli so that we could place our order and pick it up on the way back. The farmer’s market was amazing and adjacent to Kerrytown indoor markets which was full of unique vendors. It’s always refreshing to be reminded of the agricultural goldmine Michigan with beets, blueberries, honey, sunflowers, early golden delicious apples, and the list could go on and on. We grabbed iced coffees from the Roos Roast booth since they had been on the to-do list anyways and sipped as we walked. I may or may not have eaten pastries from a couple of booths. We were on the hunt for Fairy Doors as we walked; a reader had mentioned this cool Ann Arbor quirk and we had heard some were nearby…no luck though and it was time to pick up our sandwiches! Oh my YUM! Zingerman’s Deli lived up to the hype. Photo by Lyndsay Israel. Zingerman’s Deli was so cool! Misleading in size when you first walk in, it’s hard to believe how big of an establishment it is based on the entryway. If you want to hang out while you eat all the goodies from inside, they have a patio out back. Based on the pro tip we had received from a friend at the Ann Arbor Area Convention & Visitors Bureau, our sandwiches were already made so we got to jump the insane line to pay and get out of there. Rumor has it the sandwich line can get up to two hours long, so I don’t know why you wouldn’t want to call ahead. 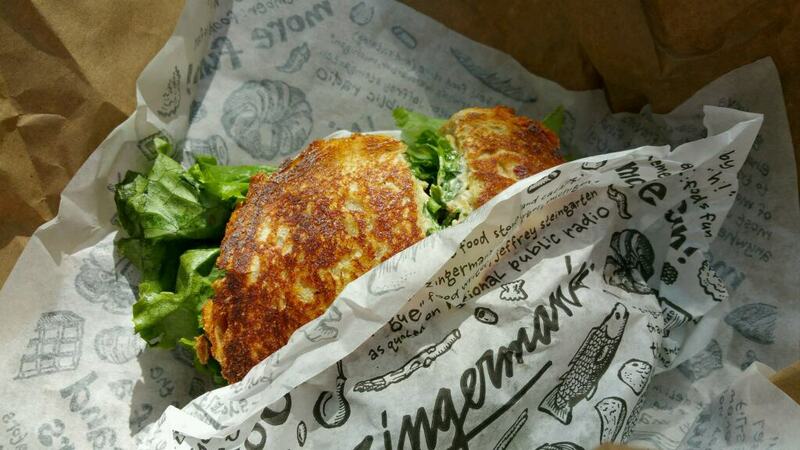 I’ll be looking more closely at why Zingerman’s is so popular in my next Ann Arbor article, so stay tuned for that. Sandwiches in hand, we headed back toward the car, only getting held up once by a cool store across the street called Catching Fireflies. Our meter ran out, so we hurried back and headed toward some cool breeze on the Huron River. The Argo Canoe Livery was, to put it bluntly, packed. It was a hot day and groups of ten and fifteen people stood in line as cars hunted for parking. A quick thundershower thinned the herd a little and we agreed that we were willing to brave it on the 1.5 hour trip to Gallup Park. 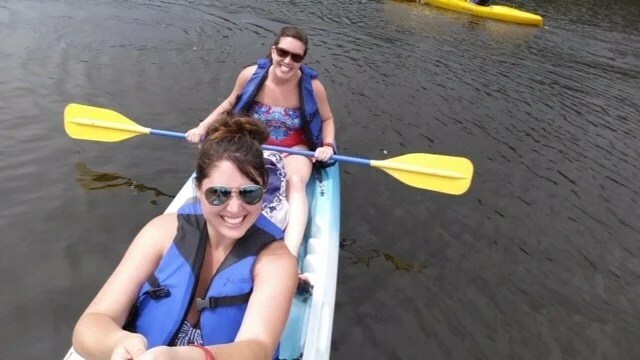 Armed with our brand new selfie stick, we took the river by storm. We decided on a two-person kayak since it was such a good price ($25), but all of the pricing was reasonable. The large groups took tubes or rafts and there didn’t seem to be a shortage of watercraft in spite of the crowds. The river starts with some speedy rapids and a quick current but mellows out after about fifteen minutes. The only stressful part is avoiding any tubers, which I was stressing about in my position as steerer. We made it to Gallup without incident and loaded up in the provided vans back to Argo – the skies had stayed dry for us! New Holland Paleooza & a blueberry cocktail at Zingerman’s Roadhouse. Photo by Lyndsay Israel. Our sandwiches were so good that we seriously considered getting more for dinner. Luckily, Zingerman’s has a roadhouse as well as their deli, so we took a rest and sipped a Proper Soda on the Hilton Garden patio after kayaking and then headed there. The roadhouse is located ten minutes from the hotel and ten minutes from downtown so we decided to keep the car with us that night. We feasted on homemade bread and butter, bruschetta with goat cheese and mushrooms, beet salad, and corn dogs with Zingerman’s own mustards. I ordered a New Holland Paleooza and my companion sipped on a blueberry cocktail that went nicely with the goat cheese. Again, we could have occupied the patio for the whole evening, but we mustered our energy and went back downtown. Literati Bookstore. Photo by Lyndsay Israel. The art fair was closing down so we were able to snag a parking space in a structure. 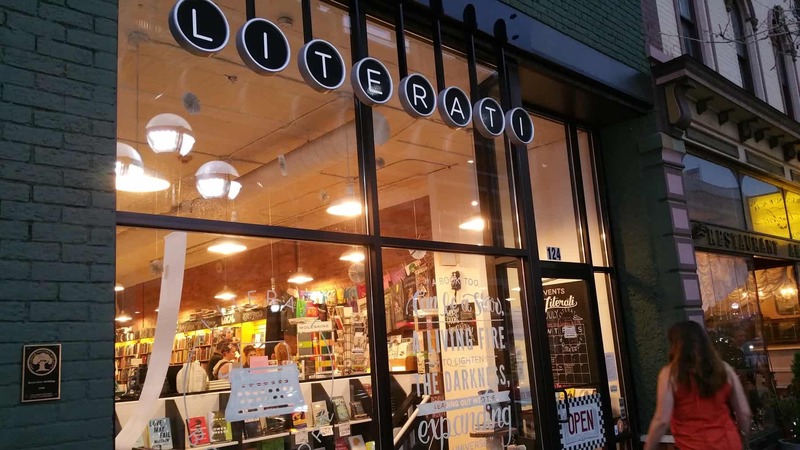 We discovered Literati, a bookstore that I could have spent an full day in, and both walked out with wallets a little lighter. I swung through Arbor Brewing Company to buy the significant other a bottle of Divette, a lightly barrel-aged blonde, and then we ended at Grizzly Peak Brewing Co. with a flight of their flagship beers. I would recommend the Bear Paw Porter as a wonderful nightcap. As we walked back to the car, I saw Sweetwaters Café lit up; a place that there was a rumored fairy door…so we went in and looked all around like crazy people until we found it! Feeling accomplished, we called it a night and headed back to the hotel. 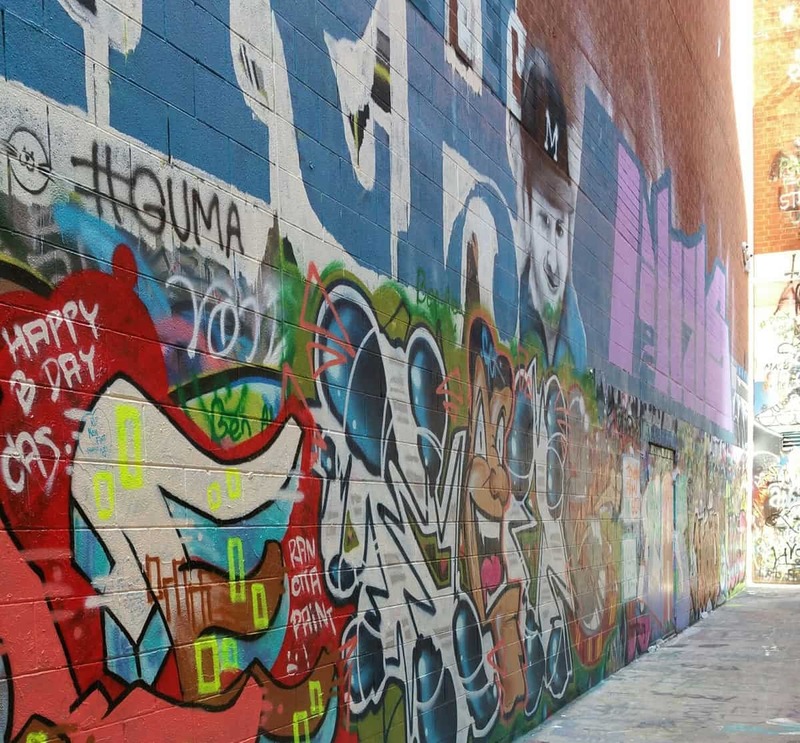 Graffiti Alley. Photo by Lyndsay Israel. Even though we had places to be by Sunday afternoon, there was one more place we needed to see before we left AA. My travel companion had heard of the graffitied alleyways so we parked close to State Street and wandered until we found it. The streets were quiet on Sunday morning and we had this particular art to ourselves. After a mini photo shoot, we packed up the gear and both headed towards home to get ready for the week. Special thanks to our sponsors for making our #MittenTrip to Ann Arbor possible: Verizon, Shorts Brewing, Great Lakes Proud, New Holland Brewing, Proper Soda Company and High Five Threads. Tagged Ann Arbor, Ann Arbor Area Convention & Visitors Bureau, ann arbor art fair, Ann Arbor Farmer's Market, Arbor Brewing Company, Argo Canoe Livery, Bed and Butter, Beer Grotto, Bill's Beer Garden, Blank Slate Creamery, Broken Egg Café, Catching Fireflies, Fairy Doors, Fleetwood Diner, Gallup Park, Grizzly Peak Brewing Co., Hilton Garden Inn, jolly pumpkin, Literati, mittentrip, New Holland Brewery, Proper Soda, Roos Roast, Sweetwaters Café, Wolverine State Brewing Co., Zingerman's Deli. Previous: 3 New Ways to Enjoy this Summer’s Zucchini Abundance!